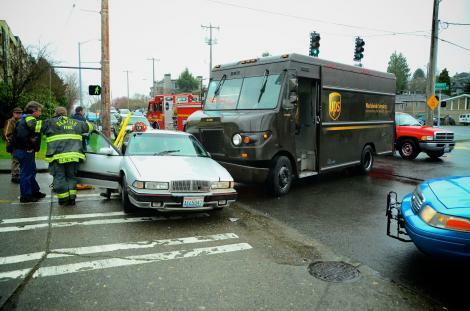 A Seattle woman was injured and subsequently hospitalized Tuesday evening after she was involved in a delivery truck accident with a UPS truck in West Seattle. According to police records, the woman was driving northbound on Fauntleroy Way SW near SW Edmunds Street just after 5 p.m. on Tuesday. The exact circumstances of the accident were unclear, but it is apparent based on photographs of the scene that the UPS truck T-boned the vehicle. A UPS supervisor was reportedly on the scene of the accident but would not discuss the incident with news outlets. The impact caused significant physical damage to the driver’s side door and the driver was transported to a nearby hospital with non-life threatening injuries. Delivery truck drivers are often under pressure to make all of their deliveries on time, which can make drivers hurry to and from each delivery. Most delivery truck companies have an obsession with being efficient and quickly being able to serve a high volume of customers. Unfortunately, this obsession creates a lot of pressure for employees who, through no fault of their own, are pressured by their employers to meet delivery quotas. This puts countless innocent drivers at risk of accident, which can be illustrated by this particular delivery truck accident.